Nature laid on the right weather for our boat, bearing one of the revered offshore names, to show us its mettle. The boat was a Haines Hunter 650 Classic Offshore, and the weather a 20-plus knot breeze building a nasty sea of an awkward length: too long to be treated like corrugations (which would mainly be a matter of choosing the right speed), and too short to avoid some solid collisions with a lot of the waves. The right speed and trim were important, of course, but also a certain amount of nerve. 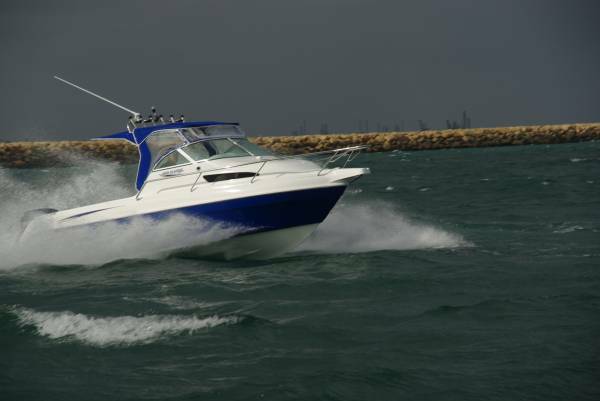 Like many sea-kindly hulls this one performs more smoothly with more throttle (up to a point, which is where some nice judgement is called for). We got it pretty right, and used a lot more speed than anyone would be likely to use on a pleasure day in those conditions. The bow was frequently wedged up, but never more than half the length actually left the water and the decelerations of the bow when landing were acceptably smooth. The solid construction showed up with that sort of treatment: no jarring, strange noises or resonance in the hull, and no rattles from the fittings. The whole Bimini-Targa makeup was commendably rigid. One pair of fittings notably absent – and missed in the day’s conditions - was footrests to complement the very good swivelling and sliding pedestal seats. The reasonable explanation was that, yes, footrests are included, but the dealer tailors their height to suit the buyer’s leg length. With rests in place the driver’s position would move into the excellent class. Windscreen height is right to look through it seated and over it standing; the windscreen has an attached grab rail around its perimeter; the throttle-gear lever is on a pedestal with plenty of room around it for the driver’s hand (this is surprisingly unusual), and lever and wheel are in nice association with a seated driver. The dash space available for electronics is vast, capable of easily swallowing a 10-inch display. Driver and mate are spoiled with personal storage. The mate gets a glove box and side pocket, and both have large moulded bins at deck level capable of holding anything up to a scuba cylinder. 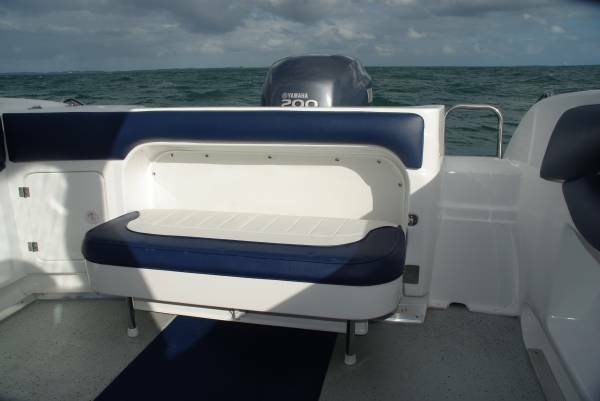 There are more pockets further aft, with hip padding around them and rod racks below them. 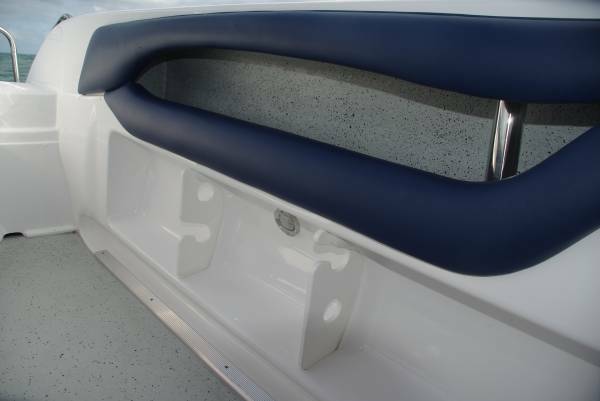 More storage is on offer in the long under deck compartment, which could alternatively be a catch tank. This is not a completely new model, but when making new moulds recently Haines Hunter added sub moulds to improve on layout. In recent years too they completely reorganised their production procedures, incorporating a rigorous quality control system. Among the ways this shows up is the thoroughness of finish: it is impossible to find a square centimetre of naked fibreglass. Every surface is off-mould gelcoat, upholstered, or flow coated. 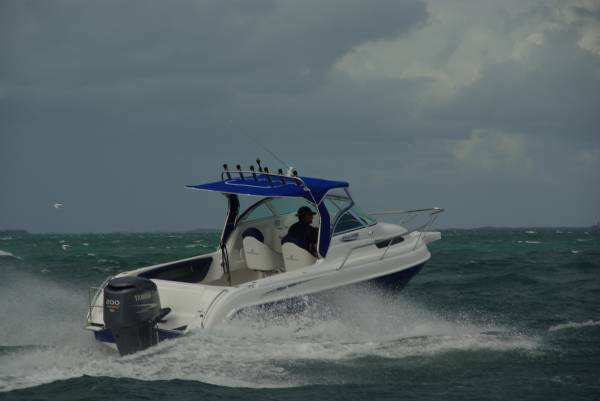 Though leaning strongly towards fishing, the 650 has a cabin with full rear bulkhead and enough size for overnighting. Equipped with a flush clear hatch, a chemical toilet, and long bunks converting to a large double, it has comfort without the flash of items like roof lining or lights – which are optional if you want them. It’s the sort of cabin to cope with a night at the ramp carpark ready for an early start. When clearing the decks for fishing, the rear lounge disappears in one of the neatest folding actions afloat. The transom it is absorbed into also houses the twin batteries – a very worthwhile safety item – and a large live bait tank. The lounge’s back padding remains in place meaning thighs are given the soft treatment all round the cockpit. The 650 has particularly good stability at rest, so there is no real limit on numbers sharing any section of padding. The Bimini has a good, cantilevered rear extension to give shade to most of the cockpit. The rocket launchers, though, are mounted on the Targa so reaching rods is a stretch. But there are alternative rod sockets in the coamings, and in the optional bait tray. 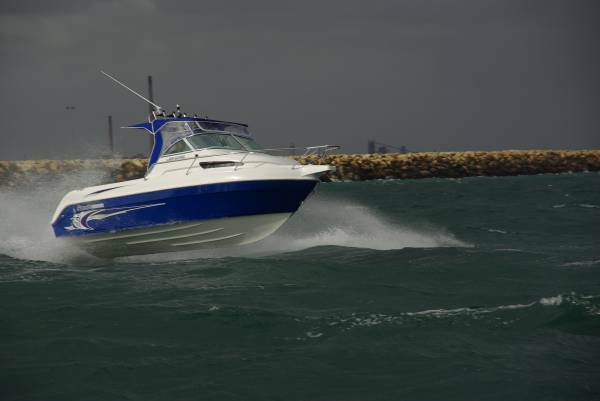 Plenty of options are available, and for a not-quite dedicated boat like this they make sense: why pay extra for unused capability? 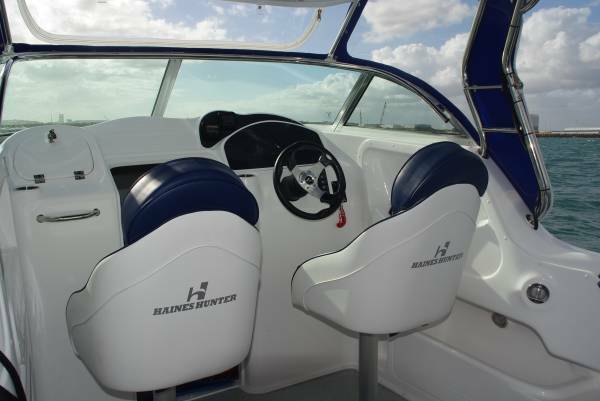 The review boat had added a power windlass and clears between glass and Bimini, pushing the price up from $95,000 to $97,500. Other items on offer include stereo system, fridge-freezer and seat box, bait tank aerator and clip-in carpet. 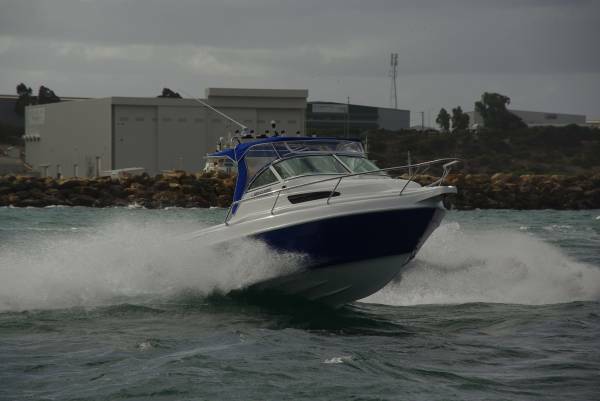 The motor fitted was a 200hp Yamaha four-stroke. It provided more performance than we were able to use on the day, and probably more than you would use on better days. A solid reserve of power is always worthwhile, but deleting horsepower is one of the easiest ways of saving money. That said, the package presented felt the part: a boat that needed nothing more than a tank of fuel to be complete.